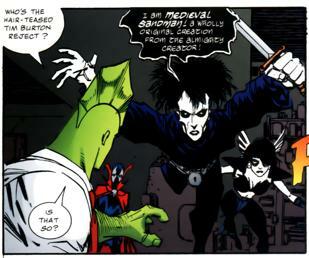 One of the Creator’s creations was Medieval Sandman, a pale-skinned man who was one of a group based on existing superhumans. The Dragon stumbled across this group of freaks while being given a tour of the under-construction Chicago, following the fall of CyberFace. In the resulting fight, Medieval Sandman and his companions were all killed while protecting the Creator from his own falling headquarters.